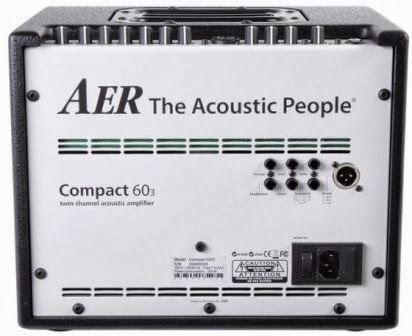 Today we are looking at what is purported to be one of the best acoustic guitar amplifiers on the planet: the AER Compact 60/3. Designed for small gigs, this unit can handle both acoustic guitar and vocals simultaneously all in one ridiculously small package that includes digital reverb, delay, and chorus. 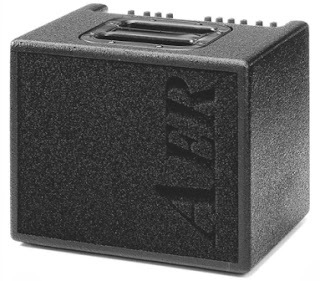 AER is a German company that has building amplifiers in Ruhr since 1992. 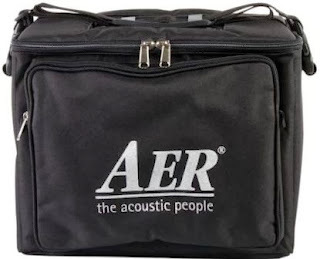 They have recently branched out into bass and electric guitar amps, but they made their name on their acoustic combos. They have stuck true to their mission, and their amplifiers are still built in Germany. The Compact 60/3 is rated for 60 watts (into 4 ohms), but I have not been able to figure out where the “3” in the model name comes from. This solid state unit (class AB, I think) drives a single dual-cone 8-inch speaker. This comes in a nicely-sized package, measuring around 10 x 10 x 9 inches, and weighing a tic a little over 14 pounds according to my scale. The cabinet is made of ½-inch birch plywood, and it is sprayed with a tasteful black nubbly finish which goes well with the gray foam grille cover. It is small enough that the microphone stand mount is a viable option for this amp. There are a few different things going on around the backside of the 60/3. There is a power switch and an IEC-type power cable (yay! ), a ¼-inch line out and an XLR direct out. There is also an effects loop, a tuner out, a footswitch jack and a headphone jack. On top of the combo are the inputs and controls for the two channels and the digital effects. Channel one has a ¼-inch input with a pad switch, a three band EQ, a gain control and a color switch. The color switch filters high frequencies so they are either softened or enhanced. Channel two has a combination XLR-1/4” jack with a line/mic switch, a two band EQ and a gain control. The effects controls include a four-way effect selector, a level control and a pan knob. 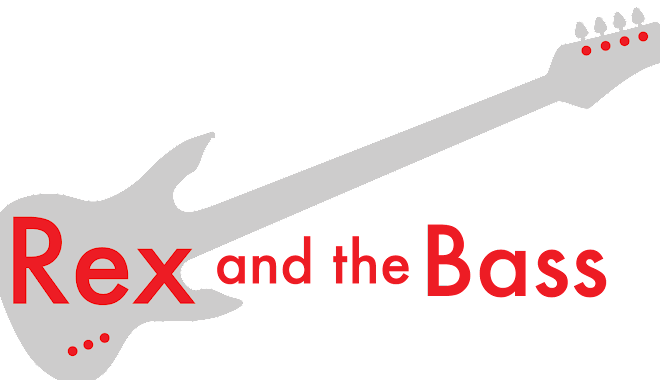 The pan knob controls how the internal effects and external effects (from the effects loop) are blended with the original signal. So, when the knob is turned all the way to the left, the internal effect will go to channel 1 and the external effect will go to channel 2. In the middle position the effects are split evenly between the channels, and when the knob is turned all the way to the right the internal effects go to channel 2 and the external effects got to channel 1. 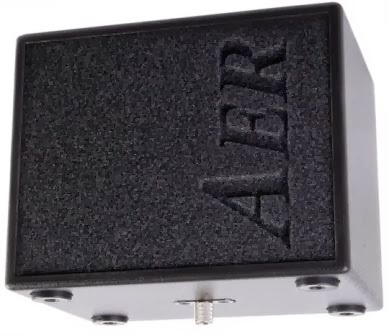 A foot switch can be used to turn the internal and external effect ON or OFF as well. Whew. So, this amp has a lot of features and potential crammed into its tiny guts, and it certainly lives up to AER’s claims that it is compact and lightweight, but how well does it work in the real world? After messing around with the effect controls and getting them the way I wanted them, I conclude that the Compact 60/3 is a fabulous amplifier. I tried it with my Takamine EF341SC (active pre-amp) and my Martin D-18 Golden era that as a K&K Sound Pure Mini pickup installed. It performed as superbly with both of them. The sound reproduction with both instruments was very true with the EQ set flat. As there are no controls on the Martin, I was able to optimize the tone with the 3-band EQ. I color switch calmed down the top end on the Takamine nicely when I really laid into some heavy strumming. The effects are very good, and I though both of the reverbs (short and long) and the delay were certainly usable. The vocal channel is also very good. I found the effects to be better served for this input, and adding a touch of reverb, delay or chorus made me sound a more palatable. For its size, it is very loud, and it has such a natural tone that its output is such that it sounds less like an amplifier and more like the world’s biggest guitar is being played. It is a bit lacking in the bass department at higher volumes, but that is to be expected with the size of the speaker and cabinet. It would be fine for a coffee-house or small wedding/party gig, but it seems like it would be better served in the studio or at home. But there are some downsides, and they are all related to what I expect from an amplifier that costs this much moolah. 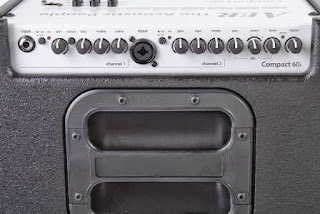 For starters, there should be an output to power another speaker cabinet. Also, I would like to be able to use more than one of the onboard effects at a time, and the delay and reverbs should be adjustable, not just ON or OFF. Despite these gripes, I would buy one if I had the cash, but for now my old Fender Acoustasonic will have to do the job for me. Should you choose to buy the AER Compact 60/3, they are not exactly cheap, with a list price of $1299 and a street price of $1099. This price includes all of that German handiwork and a nice gig bag. How could you go wrong? Wow, that amp has an interesting set of features. Did you try it out with any dropped or open tunings to see how it dealt with guitar tones lower than E? Thank you for this. I have this amp & thought i’d broken the effects loop. until i read here about how the pan pot controls the external / internal effects! only had it 3 years!